Do you know how to tell if your roof is leaking? How do you know if you have a leak in your roof? What should you do if you find a sudden need for a Dallas roof leak repair service? By reading this post, you can learn how to find a leak in your roof and what to do if you find one. Just because you see signs of water damage on the ceiling isn’t a sure sign of a leak in the roof. The spot could have been caused by leaking pipes or condensation. Even signs of water damage in the attic don’t necessarily mean that your roof is currently leaking. The stains could have been caused decades before when there was a different roof on the home. How Do I Check for a Current Leak? To discover if a stain or leak is current, check the suspect area during a rainstorm or when snow is melting on the roof. 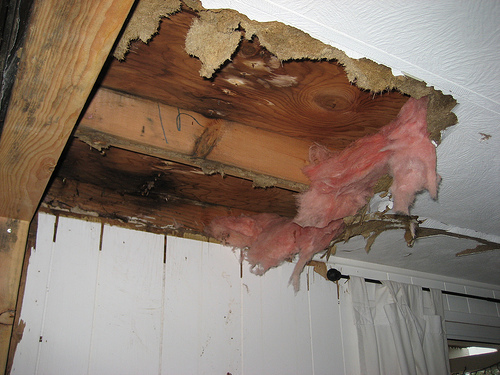 Damage that appears within five hours is usually the result of a leaking roof. The water can pool above the ceiling, putting an extreme burden on it. If you see a part of your ceiling that bulges, you need to drain the water by placing a bucket beneath the bulge and piercing it with a 16-penny nail. If you don’t drain the water, your ceiling could fall. A roof leak causes structural damage when left untreated. Calling a professional is the only sure way to diagnose what might be the problem. Water can quickly cause a lot of damage, but the reason for a leak isn’t always easy to figure out. Nails Coming Out / Getting Loose — Over time, the nails used for the roof can work their way loose or can come out. The small hole they create can allow water into the home, and that could be why there is water in the ceiling. Broken / Worn-Out Shingles — Shingles can be broken, or they can become brittle and crack over time. It depends in part on the type of material used for the shingle. Broken or cracked shingles provide a path for water to get into the home. Improperly Laid Roofing — If the roofing work is not done properly, or if there are unseen gaps in the shingles or the other roofing material used— this could be the reason water is getting into the home. Porous Skylights — Skylights can sometimes be part of the problem. They may look beautiful and are a necessity for many modern homes, but if they aren’t done properly, they can let water into the home. Poor / Cracked Flashing — Improperly installed flashing or flashing that has been damaged due to nearby branches or weather can result in gaps in the roof that eventually wear down and allow leaks into the home. Loose / Damaged Fasteners — Roof fasteners can sometimes become damaged or completely removed after high winds or other strong weather. Once the fasteners are loose or gone, water can invade, as well as cause other issues such as mold. Old, Outdated Roofs — The age of a roof is another significant factor. Hopefully contractors did a good or satisfactory job, but some poorly installed roofing may not show for years later. In any case, roofs that were built decades ago may have been built with outdated materials and materials that may not be as durable as more modern roofs. Leaky roofing causes other damage that can jeopardize the integrity of your home. The roof on any home is there to serve a purpose. Its purpose is to guard the interior of the home from high winds, sleet, snow, rain, and other weather elements. Homeowners are forced to spend a significant amount of money and time on fixing a roof when it fails to uphold its purpose. When a roof fails, it does not only fail as a protective barrier from the damaging elements, but it can also lead to extra expenses if the damage continued into the home. Homeowners should be aware of the problems their roof may be showing. What Does a Problematic Roof Look Like? There are a lot of signs that a homeowner can look for to see if there may be any current or future problems with their roof. Siding, shingles, and sheathing may start to decay. This can occur from having poor ventilation. Staining that appears on the ceilings normally means that there is a problem with your roof. The shingles could be broken, coming up, or completely gone. If this is not repaired quickly, it could potentially cause more damage throughout the home. You could possibly have a problematic roof if you are noticing an increase in your utility bills. The heated air that you are attempting to keep inside the home is escaping through some area in the roof. This issue could also be caused by seals around the exterior of the home. Shingles that are missing, broken, or damaged in any way should be replaced as soon as possible to prevent any further damage to the roof or ceiling in the home. Shingles that have a dirty look to them are potentially damaged. Pollutants from the environment such as fungus, vegetation, or algae can cause the shingles to have a dirty look to them. When a shingle ages and loses granules, they may also have a dirty look to them. What a Problems Could Unseen Roof Failure Cause? When a roof has issues or problems and they go unseen, chances are, to fix or repair the roof could cost more in the long run. The age of a roof has a lot to do when the roof should be replaced. The longer a roof leaks, the greater the chances of damaging another part of the home, resulting in more money and higher replacement costs. The monthly bill for heating and cooling a home is partly determined by how well your home is insulated. If the roof is missing shingles and the weather barrier is torn, heat and air could escape. This could cause an electric bill to exceed the normal. Roofs with leaks cause an overall drop in curb appeal, subsequently lowering selling value. What can Homeowners Do about a Problematic Roof? When there is a problem with the roof, the first thing the homeowner should do is to access the situation. In some instances, calling immediately is best, so a reputable professional can prepare a quote to fix the damages. Once the damages are reported, an expert will educate the homeowner on the best methods for fixing your problematic roof. A roof is under constant attack. Even on sunny days when you think your roof is safe, it is being affected by sunshine and wind. If you understand what things can damage your roof, you’ll make better decisions when you buy a roof system. Sun — The excess heat and ultraviolet rays deteriorate roofing materials over the years. Sides that face west or south deteriorate faster. Rain — If water gets beneath the roofing materials, it can get into the roof deck, which will rot the roof. Mildew is attracted to excess moisture, which can also rot the ceilings, walls, insulation and electrical systems. Wind — Shingles’ edges can be lifted in high winds. This pushes debris and water beneath the shingles. Very high winds can ruin a roof quickly. Snow / Ice — Melting snow often refreezes where the surface is cooler, such as at your roof’s overhang. This forms an ice dam that blocks proper drainage into the gutter. Water is forced back beneath the shingles and finds its way into the interior. During the early melt stages, gutters or downspouts are the first to fill with ice in spring, which can ruin them. Sometimes the ice is so heavy that the gutters and downspouts are torn off the home. Condensation — Condensation is the result of a buildup of warm, humid air. In a poorly ventilated attic, this encourages the wood deck and rafters, which might destroy the entire roof structure. Bigger or additional vents give sufficient attic ventilation, which alleviates problems since the attic air temperature will be similar to the air temperature outside. Moss / Algae — Moss can grow on moist wood. Moss holds moisture against a roof system’s surface, which causes rot. Moss roots can also permeate a wood deck and structure. Algae grows in damp, shaded areas on wood too. It creates a black-green stain. Algae can hold moisture, which causes deterioration and rot. Trees and bushes should be pruned away from buildings to get rid of damp, shaded areas. To guarantee good drainage, gutters should be kept clean and free of debris. Trees / Leaves — Your roof can scratch and gouge roofing materials if the branches are blown back and forth by the wind. Falling branches from overhanging trees can puncture shingles and other roofing materials. Wet leaves on your roof’s surface cause rot. Leaves and sticks in the gutters block drainage, which causes water to spill onto the roof and walls. Debris — Debris can build up on your roof, and one of the most common culprits is the trees you have in your yard. Sticks, leaves, and pine needles can form piles of debris that can begin to weigh rooftops. It is a worthy idea to inspect your trees and remove branches that may end up causing problems for your roof. Gutters — Unkempt gutters and downspouts is a common issue that results in roof damage. If these are not properly maintained or not cleared of debris, water can back up and cause ugly issues with your roof over time. Wind — Wind is another natural “disaster” that can take a toll on roofs. Wind can damage shingles all around, resulting in leaks through ceilings or even down the walls. If you notice stray shingles (or even bits and pieces of shingles) on the ground from time to time, it is a good indication that you may want to check the roof and assess problems that may be beginning to take root. Animals — Animals can and sometimes do result in some costly damage as well. This may include nesting birds, squirrels, mice, raccoons, or even bats. Missing / Torn Shingles — Having missing or torn shingles permits water to damage and rot your roof. Nearby shingles will also be damaged eventually. It’s important to replace damaged shingles immediately, before they cause other damage. Old shingles should also be replaced, since they are susceptible to being blown off the roof or torn by the wind. Missing shingles cause structural and interior damage. Flashing Deterioration — Flashing leaks are oftentimes mistaken for roof leaks. Tight, good flashings around chimneys, vents, skylights and wall/roof junctions can prevent water from getting where it can damage insulation, ceilings, walls and electrical systems. Flashings should be inspected twice a year. The best thing to do if you find a leak is call us. We’ll send over a crew to check out your roof, and let you know how we’d repair it for you. We’ll check the flashing, shingles, vents, chimneys and any other areas where water could pool. Leaks cause more than property damage. Gain peace of mind by calling Texas Star’s roofers. Usually, snow or ice melts the next day, and then it’s gone. However, during extended periods of sub-freezing weather, ice accumulates at the edge of the roof. This happens because the eve beneath this section of the roof is not warmed by the heat inside of the house like the attic is. Over the course of several days, the ice dam is two or three inches tall, or more, and when the final thaw comes, the water backs up behind the ice dam to a point where it spills over into the interior of the house. It usually becomes evident on an exterior wall in the vicinity of a valley, or where a vertical wall comes up out of the roof. Acceptable building practices and codes in this area of the country don’t address this phenomenon since it’s occurrence is so rare. In the northern climes, an “ice and water shield” is applied around the perimeter of the house to a point two feet inside the exterior walls. An “ice and water shield” is a roofing membrane made of modified bitumen, a rubber-like material, that swells up around the roofing nails nailed through it, to attach the shingles on top of it. This repels the water until the ice melts and the water can drain off of the roof, unlike standard roofing felt where the water finds a nail hole and makes its way inside. If you are experiencing ice damming, it may never happen again. Below-freezing weather in Dallas is rare. If you want to do some preventative maintenance, we would recommend the installation of an ice and water shield in the affected valley, and horizontally along the roof’s edge for several feet on each side of the valley. Call Texas Star Roofing, and we’ll make sure you don’t have any ice dams in your gutter, and we’ll let you know what gutter shield options we have available. Don’t fret! Oftentimes roof replacement isn’t necessary, as some leaks are totally isolated problems. They may only affect a small area of the roof, or they may only affect a few shingles. It is possible that when a roofing problem is isolated, a repair could be all that is needed. A repair of a roof may only cost a few hundred dollars, instead of the thousands for a replacement. When a repair is done properly, it can bring new life back to a roof and can allow the roof to last for many more years. However, at some point in time, almost every home will have to have their roof replaced. Some roofs can last for 50 years and others will struggle to last 20 years. If a homeowner is not an expert in roofing, they should call in a professional like Texas Star Roofing to help them make the choice of whether to replace or repair when they have a leaky roof. Your chimney won’t help you very much if it’s leaking, and the only way to prevent leaks is to stop any moisture or water from penetrating. Sometimes, when a chimney leaks, there’s a problem with the mortar in the chimney itself. Usually, that means that the mortar wasn’t mixed properly, most likely because it contains too much sand. Ideally there should be more cement than sand, but some contractors use extra sand to make the mortar go further when it’s applied. When mortar contains too much sand, it can become porous, which allows rain to soak through the mortar and down through the chimney. The mortar can also crack when it’s applied due to uneven drying caused by the incorrect blend of cement, sand and lime. This can make the crowning on top of the chimney leak. How badly it leaks depends on the type of material beneath the crown. The worst material that can be used under the crown is sheetrock. Wood and plywood are much better for chimney crowns than sheetrock. If the crown of your chimney is leaking, you’ll need professional help from Texas Star. A good chimney crown that was made with mortar that was properly cured should last forever. However, if we discover that the mortar is cracked, we can replace the crown for you so that your chimney doesn’t leak anymore. A leaking roof causes an array of problems for Texas homeowners. Call our Texas roofers for the best roof leak repair service in Dallas.